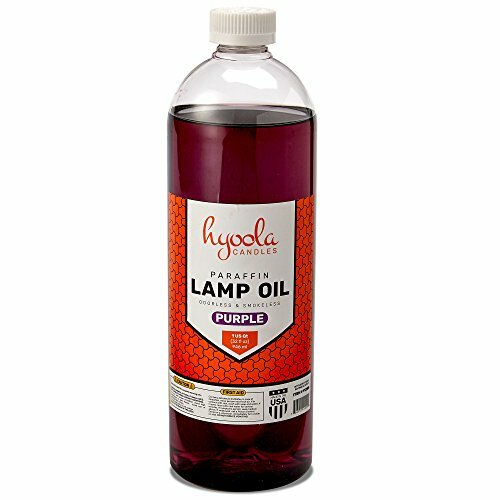 This Paraffin Lamp Oil by Hyoola Candles is processed, refined and distilled more than traditional kerosene to produce a light source suitable for both indoor and outdoor use. Able to be used with any Lamp Oil wick (Cotton or Fiberglass) , this oil fuels a smokeless, odorless flame. Now you can kindle your lights, light your lanterns and more without the soot or strong, unpleasant odor of kerosene. While gentle for indoor and home use, Hyoola Candles's Paraffin Lamp Oil is also powerful for outdoor venues. Light your tiki torches with this oil for outdoor barbecues and pool parties. Create beautiful, glowing centerpieces for weddings and fancy events. Light the pathway to an outdoor wedding canopy with a series of flames fueled by this oil. Illuminate restaurant tables and buffet counters for a romantic touch. Keep a bottle of Hyoola Candles's Paraffin Lamp Oil in store and be prepared for any power outage. Allowing you to light oil lamps and lanterns. Hyoola Candles's Paraffin Lamp Oil comes in an assortment of six different colors so you can customize your glow to suit your taste. • Don't Mix Different Fuels. Remove old residual fuel from the fuel reservoir before filling with Fuel. You certainly don't want to mix fuels together. Mixing fuels will change their burning properties and may cause excessive smoke. • Use a Clean, Uncontaminated Lamp Oil Wick (cotton or Fiberglass). The wick is the delivery vehicle for the fuel. If the wick is contaminated with old fuel or water, it will not perform properly. • Keep the Wick Height to a Minimum which Inhibits Smoking and Conserves Fuel. The wick should be as low as possible. This will reduce smoke, provide a more consistent flame and conserve fuel. IMPORTANT: Even the purest oil smokes if used improperly. ASSORTED COLORS: Pick one of our five colored lamp oils to customize the look of your flame to match your decor and style. Choose from transparent, green, blue, purple, or red shades. IMPORTANT: This Lamp Oil WILL NOT color the flame. If you have any questions about this product by Hyoola Candles, contact us by completing and submitting the form below. If you are looking for a specif part number, please include it with your message.